The humanitarian month of 2018 in the province has ended, but the results of it is still there. With enthusiasm and enthusiasm in propaganda and mobilization of the Red Cross at all levels, the mobilization of the participation of many units and benefactors in and outside the province together. sharing with the needy people needing help. Caring for disadvantaged people, helping them have better living conditions, is one of the regular activities of the Red Cross at all levels in the province. This work continues to be effective through Humanitarian Month has been implemented in the province. Implementing the plan of the Vietnam Red Cross Society on the implementation of the humanitarian month of 2018, the Red Cross has developed the plan and quickly implemented it across the province. All levels have actively advised Party committees and local authorities on the deployment of humanitarian month in the area; At the same time, it is deployed to agencies, sectors, unions, businesses, donors, volunteer clubs, religious and social organizations to call for mutual assistance and registration. support objects. Nguyen Thi Le Trinh, Chairman of the Provincial Red Cross, said: "In order for humanitarian month to be deployed extensively in all strata of the population, the provincial levels have stepped up the propaganda and propaganda activities. on and on the mass media to help officials, members and people understand the guidelines, purposes and meaning of humanitarian month; At the same time, propaganda and mobilization of collectives and individuals to help those who are in difficult circumstances ... With the participation of the Party's committees and authorities, the response of many mass organizations, Businesses and benefactors have contributed to make the humanitarian month of 2018 widely deployed, becoming the whole people care for the poor under the leadership of the Party, which is the core organization of the Red Cross. 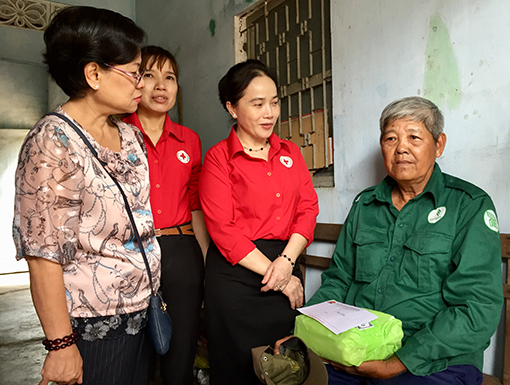 Nguyen Thi Le Trinh (2nd from the right), President of the Red Cross visit and give gifts to an unnamed person in the humanitarian month of 2018. Promoting effectiveness, the Red Cross at all levels have conducted surveys, got the list of objects to help address the right. The list of subjects was conducted very carefully, openly and democraticly, with the participation of all levels of government, the Fatherland Front Committee and local mass organizations. On the basis of the list of assistance, Red Cross organizations have mobilized organizations and individuals to help the beneficiaries. According to the opinion of the Red Cross, 9/9 districts, townships and Red Cross Association of Dau Tiep Rubber One Member Limited Company have performed well the deployment and selected the right target really difficult to Help in the last Humanitarian Month. In the humanitarian month of 2018, there were 20,137 cases in the province receiving help from benefactors by the Red Cross mobilized and organized, total value of 4.1 billion . Of which, 1,303 cases were supported by the provincial level, amounting to VND 477 million; At the district level, there were 18,834 cases with the total amount of 3,638 billion VND. At the district level, the Red Cross Association of Ho Chi Minh City, Tan Uyen town, Di An town; At the base, there is the Red Cross of Uyen Hung Ward (Tan Uyen Township), Phu Cuong Ward (Thu Duc District), Di An Ward (Di An Town). Di An Ward, Dien An Township is one of the localities to effectively evaluate the humanitarian month of 2018. To implement this effectively, the Red Cross of Di An Ward has actively implemented to choose the right people and call on many donors in the same area to participate in this meaningful activity. Phan Tuan Thao, Chairman of the Red Cross Association of Di An Ward, said that after the province, the town plans to deploy humanitarian month, the Red Cross Ward has developed its own plan and deployed to 9 branches The sub-assemblies are to call on donors to provide financial support and material support to implement this program. The beneficiaries are the poor, the poor, the social supporters, the unlucky people, the elderly. After the neighborhood, the list goes on, the Red Cross continues to review. Again, before agreeing on the list of objects to help. Mr. Phan Tuan Thao shared: "With the spirit of giving up rice, Humanitarian Month in the ward has received the attention of many benefactors through the support of material, funds for the program. Since then, the Red Cross has handed over over 700 gifts to the poor in the area, with a total cost of about 210 million. Can be seen, the effect that Humanitarian Month brings is very high, helping thousands of cases have more conditions to rise in life. With the money, goods, work days and other supports mobilized from the collective and individual in society, the Red Cross at all levels in the province has introduced many forms of assistance rich and creative, Practical benefits for the beneficiaries, such as medical examination and treatment, free medicine, gift giving, small business, construction and repair of the Red Cross, scholarships, production support Nguyen Thi Le Trinh said: "The Association always determines the humanitarian month for the poor. long, every year are implemented. Through humanitarian month to affirm the core role of the Red Cross in humanitarian activities, charity, and at the same time express the tradition of "good friendship" of the Vietnamese people. With its humane nature, humanitarian month has mobilized the social community to share with vulnerable people in society by meaningful activities, helping them rise in life, contributing to well implementing the social security policy of the province. In the coming time, all levels will continue to promote and link Humanitarian Month with national target programs for social groups and emulation movements of all levels. The propaganda of the meaning of humanitarian month is also focused; At the same time, to commend and motivate timely advanced figures in order to encourage and attract more and more donors to participate in the humanitarian month so as to have resources to take care of the difficult subjects. " On the start of the month of workers: "Each grassroots union - a union benefit"